The most common type of star in the galaxy is the red dwarf star. None of these small, dim stars can be seen from Earth with the naked eye, but they can emit flares far more powerful than anything our Sun emits. Two astronomers using the Hubble space telescope saw a red dwarf star give off a powerful type of flare called a superflare. That’s bad news for any planets in these stars’ so-called habitable zones. Red dwarfs make up about 75% of the stars in the Milky Way, so they probably host many exoplanets. In fact, scientists think most of the planets that are in habitable zones are orbiting red dwarfs. But the more astronomers observe these stars, the more they’re becoming aware of just how chaotic and energetic it can be in their neighbourhoods. That means we might have to re-think what habitable zone means. “When I realized the sheer amount of light the superflare emitted, I sat looking at my computer screen for quite some time just thinking, ‘Whoa. '” – Parke Loyd, Arizona State University. Red dwarf stars have become a major focal point for exoplanet studies lately, and for good reason. For starters, M-type (red dwarf) stars are the most common type in our Universe, accounting for 75% of stars in the Milky Way alone. In addition, in the past decade, numerous terrestrial (i.e rocky) exoplanets have been discovered orbiting red dwarf stars, and within their circumstellar habitable zones (“Goldilocks Zones”) to boot. This has naturally prompted several studies to determine whether or not rocky planets can retain their atmospheres. The latest study comes from NASA, using data obtained by the Mars Atmosphere and Volatile Evolution (MAVEN) orbiter. Having studied Mars’ atmosphere for years to determine how and when it was stripped away, the MAVEN mission is well-suited when it comes to measuring the potential habitability of other planets. The study was shared on Dec. 13th, 2017, at the Fall Meeting of the American Geophysical Union in New Orleans, Louisiana. In a presentation titled “Spanning Disciplines to Search for Life Beyond Earth“, a team of NASA scientists and researchers from the University of California-Riverside and the University of Colorado-Boulder explained how insights from the MAVEN mission could be applied to the habitability of rocky planets orbiting other stars. Launched in November 18th, 2013, the MAVEN mission established orbit around Mars on September 22nd, 2014. The purpose of this mission has been to explore the Red Planet’s upper atmosphere, ionosphere and its interactions with the Sun and solar wind for the sake of determining how and when Mars’ atmosphere went from being thicker and warmer in the past (and thus able to support liquid water on the surface) to thin and tenuous today. Since November of 2014, MAVEN has been measuring Mars’ atmospheric loss using its suite of scientific instruments. From the data it has obtained, scientists have surmised that the majority of the planet’s atmosphere was lost to space over time due to a combination of chemical and physical processes. And in the past three years, the Sun’s activity has increased and decreased, giving MAVEN the opportunity to observe how Mars’ atmospheric loss has risen and fallen accordingly. Because of this, David Brain – a professor at the Laboratory for Atmospheric and Space Physics (LASP) at the CU Boulder is also a MAVEN co-investigator – and his colleagues began to think about how these insights could be applied to a hypothetical Mars-like planet orbiting around an red dwarf star. These planets include Proxima b (the closest exoplanet to our Solar System) and the seven planet system of TRAPPIST-1. To determine if this hypothetical planet could retain its atmosphere over time, the researchers performed some preliminary calculations that assumed that this planet would be positioned near the outer edge of the star’s habitable zone (as Mars is). Since red dwarf’s are dimmer than our Sun, the planet would have to orbit much closer to the star – even closer than Mercury does to our Sun – to be within this zone. They also considered how a higher proportion of the light emanating from red dwarf stars is in the ultraviolet wavelength. Combined with a close orbit, this means that the hypothetical planet would be bombarded with about 5 times more UV radiation the real Mars gets. This would also mean that the processes responsible for atmospheric loss would be increased for this planet. Based on data obtained by MAVEN, Brain and colleagues were able to estimate how this increase in radiation would affect Mars’ own atmospheric loss. Based on their calculations, they found that the planet’s atmosphere would lose 3 to 5 times as many charged particles through ion escape, while about 5 to 10 times more neutral particles would be lost through photochemical escape (where UV radiaion breaks apart molecules in the upper atmosphere). Another form of atmospheric loss would also result, due to the fact that more UV radiation means that more charged particles would be created. This would result in a process called “sputtering”, where energetic particles are accelerated into the atmosphere and collide with other molecules, kicking some out into space and sending others crashing into neighboring particles. Lastly, they considered how the hypothetical planet might experience about the same amount of thermal escape (aka. Jeans escape) as the real Mars. This process occurs only for lighter molecules such as hydrogen, which Mars loses at the top of its atmosphere through thermal escape. On the “exo-Mars”, however, thermal escape would increase only if the increase in UV radiation were to push more hydrogen into the upper atmosphere. In conclusion, the researchers determined that orbiting at the edge of the habitable zone of a quiet M-type star (instead of our Sun) could shorten the habitable period for a Mars-like planet by a factor of about 5 to 20. For a more active M-type star, the habitable period could be cut by as much as 1,000 times. In addition, solar storm activity around a red dwarf, which is thousands of times more intense than with our Sun, would also be very limiting. However, the study is based on how an exo-Mars would fair around and M-type star, which kind of stacks the odds against habitability in advance. When different planets are considered, which possess mitigating factors Mars does not, things become a bit more promising. For instance, a planet that is more geologically active than Mars would be able to replenish its atmosphere at a greater rate. Multiple survey have revealed evidence of rocky planets orbiting a red dwarf stars, raising questions about their habitability. Credit: ESO/M. Kornmesser/N. Risinger (skysurvey.org). In the coming years, astronomers and exoplanet researchers hope to learn more about the planets orbiting nearby red dwarf stars. These efforts are expected to be helped immensely thanks to the deployment of the James Webb Space Telescope, which will be able to conduct more detailed surveys of these star systems using its advanced infrared imaging capabilities. 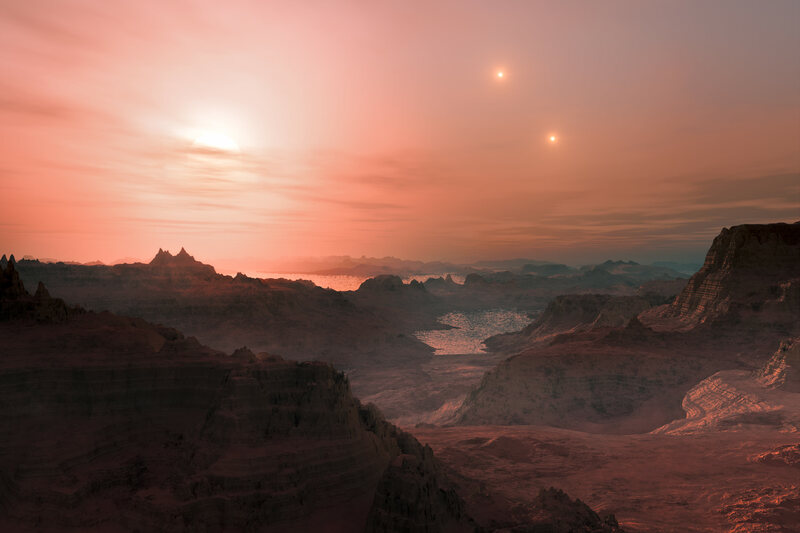 These studies will allow scientists to place more accurate constraints on exoplanets that orbit red dwarf stars, which will allow for better estimates about their size, mass, and compositions – all of which are crucial to determining potential habitability. Other panelists that took part in the presentations included Giada Arney and Katherine Garcia-Sage of NASA Goddard Space Flight Center and Stephen Kane of the University of California-Riverside. You can access the press conference materials by going to NASA Goddard Media Studios. When hunting for potentially habitable exoplanets, one of the most important things astronomers look for is whether or not exoplanet candidates orbit within their star’s habitable zone. This is necessary for liquid water to exist on a planet’s surface, which in turn is a prerequisite for life as we know it. However, in the course of discovering new exoplanets, scientists have become aware of an extreme case known as “water worlds“. Water worlds are essentially planets that are up to 50% water in mass, resulting in surface oceans that could be hundreds of kilometers deep. According to a new study by a team of astrophysicists from Princeton, the University of Michigan and Harvard, water worlds may not be able to hang on to their water for very long. These findings could be of immense significance when it comes to the hunt for habitable planets in our neck of the cosmos. This most recent study, titled “The Dehydration of Water Worlds via Atmospheric Losses“, recently appeared in The Astrophysical Journal Letters. Led by Chuanfei Dong from the Department of Astrophysical Sciences at Princeton University, the team conducted computer simulations that took into account what kind of conditions water worlds would be subject to. This study was motivated largely by the number of exoplanet discoveries have been made around low-mass, M-type (red dwarf) star systems in recent years. These planets have been found to be comparable in size to Earth – which indicated that they were likely terrestrial (i.e. rocky). In addition, many of these planets – such as Proxima b and three planets within the TRAPPIST-1 system – were found to be orbiting within the stars habitable zones. However, subsequent studies indicated that Proxima b and other rocky planets orbiting red dwarf stars could in fact be water worlds. This was based on mass estimates obtained by astronomical surveys, and the built-in assumptions that such planets were rocky in nature and did not have massive atmospheres. At the same time, numerous studies have been produced that have cast doubt on whether or not these planets would be able to hold onto their water. Basically, it all comes down to the type of star and the orbital parameters of the planets. While long-lived, red dwarf stars are known for being variable and unstable compared to our Sun, which results in periodic flares up that would strip a planet’s atmosphere over time. On top of that, planets orbiting within a red dwarf’s habitable zone would likely be tidally-locked, meaning one side of the planet would be constantly exposed to the star’s radiation. To test whether or not a water world would be able to hold onto its atmosphere, the team conducted computer simulations that took into account a variety of possible scenarios. These included the effects of stellar magnetic fields, coronal mass ejections, and atmospheric ionization and ejection for various types of stars – including G-type stars (like our Sun) and M-type stars (like Proxima Centauri and TRAPPIST-1). “We developed a new multi-fluid magnetohydrodynamic model. The model simulated both the ionosphere and magnetosphere as a whole. Due to the existence of the dipole magnetic field, the stellar wind cannot sweep away the atmosphere directly (like Mars due to the absence of a global dipole magnetic field), instead, the atmospheric ion loss was caused by the polar wind. What they found was that their computer simulations were consistent with the current Earth-Sun system. However, in some extreme possibilities – such as exoplanets around M-type stars – the situation is very different and the escape rates could be one thousand times greater or more. The result means that even a water world, if it orbits an red dwarf star, could lose its atmosphere after about a gigayear (Gyr), one billion years. Once again, these results cast doubt on the potential habitability of red dwarf star systems. 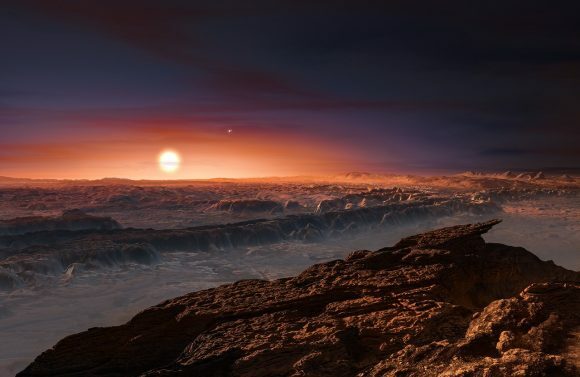 In the past, researchers have indicated that the longevity of red dwarf stars, which can remain in their main sequence for up to 10 trillion years or longer, make them the best candidate for finding habitable exoplanets. However, the stability of these stars and the way in which they are likely to strip planets of their atmospheres seems to indicate otherwise. The study is also significant as far as our understanding of the Solar System and its evolution is concerned. At one time, scientists have ventured that both Earth and Venus may have been water worlds. How they made the transition from being very watery to what they are today – in the case of Venus, dry and hellish; and in the case of Earth, having multiple continents – is an all-important question. In the future, more detailed surveys are anticipated that could help shed light on these competing theories. When the James Webb Space Telescope (JWST) is deployed in Spring of 2018, it will use its powerful infrared capabilities to study planets around nearby red dwarfs, Proxima b being one of them. What we learn about this and other distant exoplanets will go a long way towards informing our understanding of how our own Solar System evolved as well. When it comes to searching for worlds that could support extra-terrestrial life, scientists currently rely on the “low-hanging fruit” approach. Since we only know of one set of conditions under which life can thrive – i.e. what we have here on Earth – it makes sense to look for worlds that have these same conditions. These include being located within a star’s habitable zone, having a stable atmosphere, and being able to maintain liquid water on the surface. Until now, scientists have relied on methods that make it very difficult to detect water vapor in the atmosphere’s of terrestrial planets. But thanks to a new study led by Yuka Fujii of NASA’s Goddard Institute for Space Studies (GISS), that may be about to change. Using a new three-dimensional model that takes into account global circulation patterns, this study also indicates that habitable exoplanets may be more common than we thought. The study, titled “NIR-driven Moist Upper Atmospheres of Synchronously Rotating Temperate Terrestrial Exoplanets“, recently appeared in The Astrophysical Journal. In addition to Dr. Fujii, who is also a member of the Earth-Life Science Institute at the Tokyo Institute of Technology, the research team included Anthony D. Del Genio (GISS) and David S. Amundsen (GISS and Columbia University). To put it simply, liquid water is essential to life as we know it. If a planet does not have a warm enough atmosphere to maintain liquid water on its surface for a sufficient amount of time (on the order of billions of years), then it is unlikely that life will be able to emerge and evolve. If a planet is too distant from its star, its surface water will freeze; if it is too close, its surface water will evaporate and be lost to space. When it comes to terrestrial (i.e. rocky) exoplanets, previous studies were forced to rely on one-dimensional models to calculate the presence of water. This consisted of measuring hydrogen loss, where water vapor in the stratosphere is broken down into hydrogen and oxygen from exposure to ultraviolet radiation. By measuring the rate at which hydrogen is lost to space, scientists would estimate the amount of liquid water still present on the surface. However, as Dr. Fujii and her colleagues explain, such models rely on several assumptions that cannot be addressed, which include the global transport of heat and water vapor vapor, as well as the effects of clouds. Basically, previous models predicted that for water vapor to reach the stratosphere, long-term surface temperatures on these exoplanets would have to be more than 66 °C (150 °F) higher than what we experience here on Earth. These temperatures could create powerful convective storms on the surface. However, these storms could not be the reason water reaches the stratosphere when it comes to slowly rotating planets entering a moist greenhouse state – where water vapor intensifies heat. Planets that orbit closely to their parent stars are known to either have a slow rotation or to be tidally-locked with their planets, thus making convective storms unlikely. This occurs quite often for terrestrial planets that are located around low-mass, ultra cool, M-type (red dwarf) stars. For these planets, their proximity to their host star means that it’s gravitational influence will be strong enough to slow down or completely arrest their rotation. When this occurs, thick clouds form on the dayside of the planet, protecting it from much of the star’s light. The team found that, while this could keep the dayside cool and prevent water vapor from rising, the amount of near-Infrared radiation (NIR) could provide enough heat to cause a planet to enter a moist greenhouse state. This is especially true of M-type and other cool dwarf stars, which are known to produce more in the way of NIR. As this radiation warms the clouds, water vapor will rise into the stratosphere. To address this, Fujii and her team relied on three-dimensional general circulation models (GCMs) which incorporate atmospheric circulation and climate heterogeneity. For the sake of their model, the team started with a planet that had an Earth-like atmosphere and was entirely covered by oceans. This allowed the team to clearly see how variations in distance from different types of stars would effect conditions on the planets surfaces. In the end, the team’s new model demonstrated that since low-mass star emit the bulk of their light at NIR wavelengths, a moist greenhouse state will result for planets orbiting closely to them. This would result in conditions on their surfaces that comparable to what Earth experiences in the tropics, where conditions are hot and moist, instead of hot and dry. What’s more, their model indicated that NIR-driven processes increased moisture in the stratosphere gradually, to the point that exoplanets orbiting closer to their stars could remain habitable. This new approach to assessing potential habitability will allow astronomers to simulate circulation of planetary atmospheres and the special features of that circulation, which is something one-dimensional models cannot do. Beyond offering astronomers a more comprehensive method for determining exoplanet habitability, this study is also good news for exoplanet-hunters hoping to find habitable planets around M-type stars. Low-mass, ultra-cool, M-type stars are the most common star in the Universe, accounting for roughly 75% of all stars in the Milky Way. Knowing that they could support habitable exoplanets greatly increases the odds of find one. 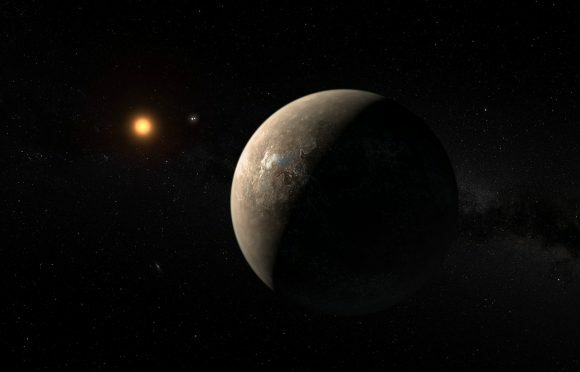 In addition, this study is VERY good news given the recent spate of research that has cast serious doubt on the ability of M-type stars to host habitable planets. This research was conducted in response to the many terrestrial planets that have been discovered around nearby red dwarfs in recent years. What they revealed was that, in general, red dwarf stars experience too much flare and could strip their respective planets of their atmospheres. 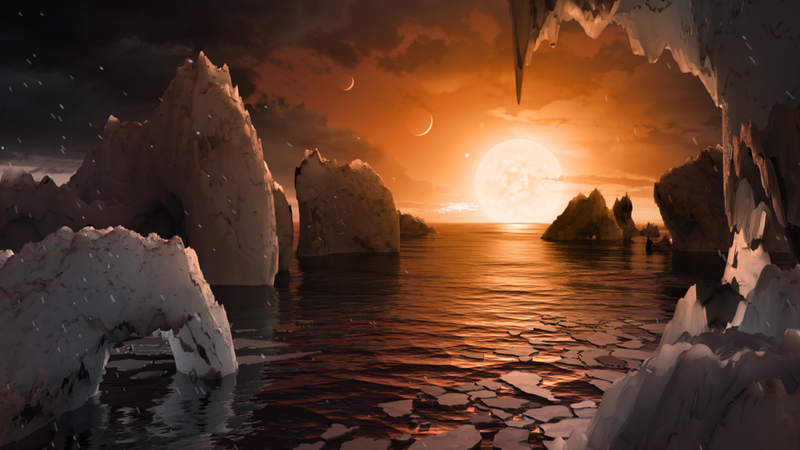 These include the 7-planet TRAPPIST-1 system (three of which are located in the star’s habitable zone) and the closest exoplanet to the Solar System, Proxima b. The sheer number of Earth-like planets discovered around M-type stars, coupled with this class of star’s natural longevity, has led many in the astrophysical community to venture that red dwarf stars might be the most likely place to find habitable exoplanets. With this latest study, which indicates that these planets could be habitable after all, it would seem that the ball is effectively back in their court!